As the crew sleep, Apollo 11 falls towards the Moon, now accelerating under its gravitational pull in the final leg of its outward journey. 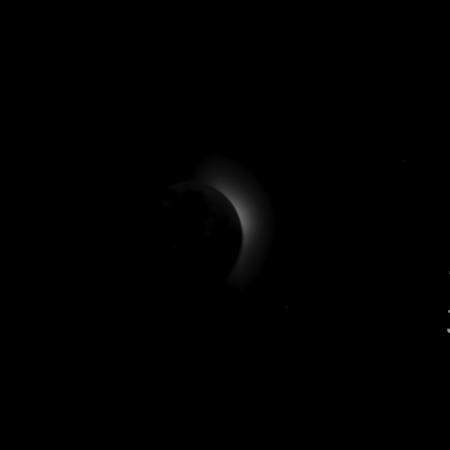 On awaking, the spacecraft passes into the Moon's shadow and they see star constellations and the solar corona clearly for the first time.  The Service Module's main engine is fired to enter a lunar orbit very close to the planned dimensions, and the crew witness their first Earthrise. This is Apollo Control at 62 hours, 29 minutes. The Flight Surgeon reports that the crew appears to have been asleep now for about the past 30 minutes. The spacecraft appears also to be holding its Passive Thermal Control attitude very well and at this time Apollo 11 is about 32,000 [nautical] miles [59,000 km] from the Moon, traveling at a speed of 3,782 feet per second [1,153 m/s]. In the past 50 minutes or so, we've seen that velocity increase about 10 feet per second [3 m/s], going from 3,772 feet per second [1,150 m/s] to the present 3,782 [1,153 m/s], as the spacecraft continues to accelerate toward the Moon. The Change-of-Shift Briefing following this shift will occur at about 11:15 pm Central Daylight Time. Flight Director Glynn Lunney and his team of flight controllers are coming on now, being debriefed by the Eugene Kranz team, and that shift change will be occurring shortly here. The new capsule communicator will be astronaut Ron Evans. At 62 hours, 30 minutes, this is Apollo Control. This is Apollo Control; 63 hours, 29 minutes Ground Elapsed Time. 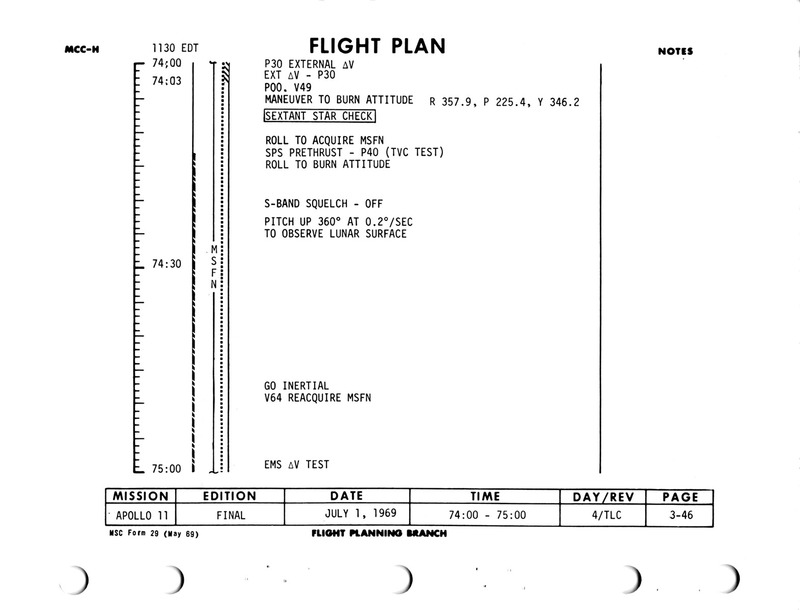 Some 5½ hours remaining in the Apollo 11 crew scheduled rest period. Crew apparently soundly asleep at this time. Spacecraft now 29,716 nautical miles [55,034 km] out from the Moon. Velocity now 3,796 feet per second [1,157 m/s]. Black Team Flight Director Glynn Lunney going around the room discussing with the various flight control positions the situation for the sleep shift. Talking now to Flight Dynamics Officer on the pros and cons of doing or not doing Midcourse Correction burn number 4. And at 63 hours, 30 minutes Ground Elapsed Time; this is Apollo Control. This is Apollo Control; 64 hours, 28 minutes Ground Elapsed Time. Some 4½ hours remaining now in the scheduled Apollo 11 crew sleep period. However, since there's a little likelihood that Midcourse Correction burn number 4 will be done, [means it will be dispensed with] since it's a very small magnitude maneuver, that the crew will be allowed to sleep another couple of hours. At this time, Apollo 11 is some 27,529 nautical miles [50,984 km] out from the Moon, traveling at a velocity of 3,812 feet per second [1,162 m/s]. The Black Team of flight controllers has settled in for the night. Everything rather quiet here in the control room. We're anticipating a playback of yesterday afternoon's TV transmission from Apollo 11 which lasted some hour-and-a-half in which the camera was taken on - taken into the Lunar Module at the end of its cable. This will be played back for the flight controllers who, at that time, were - most of them were asleep. At 64 hours, 29 minutes Ground Elapsed Time; this is Apollo Control. This is Apollo Control, 65 hours, 28 minutes Ground Elapsed Time. 3½ hours remaining in the scheduled sleep period for the crew of Apollo 11, however this will likely run to more like 5½ hours remaining. Countdown clock for lunar landing now showing 37 hours, 18 minutes. Apollo 11 now 25,280 nautical miles [46,819 m/s] out from the Moon, traveling at a velocity of 3,832 feet per second [1,168 m/s]. In terms of distance... Stand by, we thought we had some Earth-reference numbers, but apparently that display is not up at this time. Present weight of the spacecraft; 96,029 pounds [43,558 kg]. Presently being tracked by the tracking station at Honeysuckle Creek in Australia. And at 65 hours, 29 minutes Ground Elapsed Time; this is Apollo Control. It is worth noting that, strictly speaking, the PAO announcer's use of the term, weight, is erroneous though such usage is common. The correct term would be mass. Mass is the amount of matter in an object. Weight is the force that the object exerts in a gravity field. Therefore a 6-kilogram mass on Earth would still be 6 kg on the Moon. But it would weigh only one sixth what it would weigh on Earth. This is Apollo Control; 66 hours, 29 minutes Ground Elapsed Time. Apollo 11 presently 22,952 nautical miles [42,507 km] out from the Moon, and traveling at a velocity of 3,858 feet per second [1,176 m/s]. 2 hours, 29 minutes showing remaining in the sleep period. However, as mentioned earlier, this likely will run another 2 hours. Clock counting down to lunar landing, showing 36 hours, 16 minutes. Still tracking through the Honeysuckle Creek, Australia tracking station, and all is rather quiet here in the Control Center during the sleep watch. At 66 hours, 30 minutes Ground Elapsed Time; this is Apollo Control. This is Apollo Control; 67 hours, 28 minutes Ground Elapsed Time. 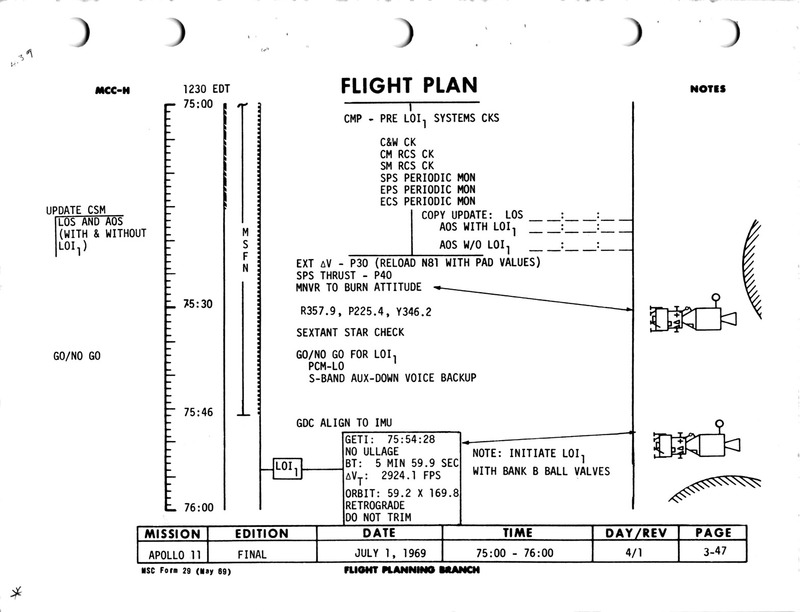 Midcourse Correction burn number 4 has been deleted from the Flight Plan on the recommendation to Flight Director Glynn Lunney from the Flight Dynamics Officer, Jay Greene. The maneuver, had it been carried out as planned, would be in the neighborhood of one-half foot per second velocity change. As it is now, the trajectory is being predicted to arrive at near-point or closest approach of about 62 nautical miles [115 km] plus or minus two miles [3.7 km] if nothing else is done to the trajectory - that is, if no maneuver is made. Spacecraft cabin pressure now holding at 4.7 pounds per square inch [32.4 kPa]; temperature, 60 degrees Fahrenheit [16° Celsius]. 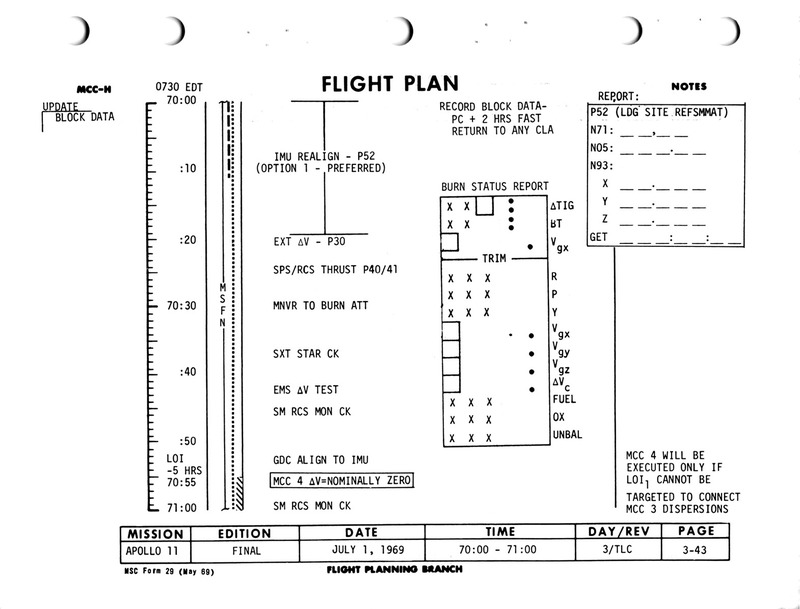 The planned sleep period has another hour-and-a-half to go but, as mentioned earlier, will likely run another couple of hours in as much as Midcourse Correction burn number 4 will not be made and the crew will not have to spend the time preparing to do the burn, to align the platform and do all the chores necessary for doing a maneuver of this sort. Clock counting down to lunar landing showing 35 hours, 17 minutes. And at 67 hours, 29 minutes Ground Elapsed Time; this is Apollo Control. This is Apollo Control; 68 hours, 28 minutes Ground Elapsed Time. Some 2 hours and 31 minutes remaining in the crew sleep period according to the revised schedule inasmuch as a midcourse correction burn number 4 has been omitted. Still being tracked - Apollo 11 still being tracked by the Honeysuckle Creek, Australia station. And, here in Mission Control, the - yesterday's hour-and-a-half long television pass, as the crew manned the LM for the first time in checkout, is being replayed. This will be piped across to the News Center for anyone who might want to view it again. At 68 hours, 29 minutes Ground Elapsed Time; this is Apollo Control. The next dialogue between the crew and ground, up to and including 069:18:26, are not currently available on NASA's online recordings. 069:13:14 Comm Tech: Goddard voice, Houston Comm Tech. GOSS conference. GOSS is the Ground Operational Support System. 069:13:17 MSFN: You're loud and clear, how me? 069:13:19 Comm Tech: Roger. Read you the same. 069:17:37 Comm Tech: Madrid, Houston Comm Tech. Net 1, voice check. 069:17:41 Comm Tech: Houston Comm Tech, Madrid. I read you loud and clear. 069:17:44 Comm Tech: Roger. Read you loud and clear also. 069:18:07 Aldrin: Hello, Houston. Apollo 11. 069:18:16 Evans: Apollo 11, Houston. Good morning. 069:18:21 Aldrin: Good morning. Are you planning a Midcourse Correction 4 this morning? 069:18:26 Evans: That's negative. Midcourse number 4 is not required. We were going to let you sleep in until about 71 hours if you'd like to turn over. 069:18:38 Aldrin: Okay. That'll be fine. We'll [radio squeal]. 069:18:48 Evans: Say again, Buzz. You were cut out there. 069:18:52 Aldrin: Okay. I'll see you at 71 hours. 069:18:55 Evans: He he, Roger. This is Apollo Control. So much for that. Looks like they're going to turn over and go back to sleep. At 69 hours, 19 minutes Ground Elapsed Time; this is Apollo Control. Planned wake-up time for the crew is 71 hours Elapsed. Cliff Charlesworth and the Green Team of flight controllers has just relieved Glynn Lunney's Black Team. CapCom now is Bruce McCandless. Apollo 11 is 13,638 nautical miles [25,258 km] from the Moon. Velocity 4,047 feet per second [1,234 m/s], lunar referenced. This is Apollo Control, at 71 hours into the mission. Apollo 11 is 12,486 nautical miles [23,124 km] from the Moon. Approaching at a velocity of 4,087 feet per second [1,246 m/s]. We'll stand by here and see whether we put in a call to the crew. We're putting a call in to the crew now. 071:03:30 McCandless: Apollo 11, Apollo 11, this is Houston. Over. 071:03:38 Aldrin: Good morning again, Houston. Apollo 11. 071:03:48 Aldrin: Would you like the O2 purge this morning? 071:03:52 McCandless: Yes indeed. O2 fuel cell purge at 71 hours, and when you feel like copying, I've got a Flight Plan update containing - I guess that and some other items for you. 071:04:08 Aldrin: Okay. Stand by. 071:06:59 Aldrin: Houston, Apollo 11. Go ahead with the Flight Plan update. 071:09:08 Aldrin: Okay. We'll get started on the fuel cell purge while we're eating. CO2 canister change number 6; secondary radiator flow check; copy some PADs. Also at 72 hours, stop PTC 0 roll. At 73; do a P52 option 3; we'll get your uplink REFSMMAT for the landing site; and - and at 000 degrees, now was this with the old REFSMMAT or the new REFSMMAT? 071:09:46 Aldrin: [Garble] antenna and, pitch. 071:09:50 McCandless: This is with the new REFSMMAT, Buzz. 071:09:58 Aldrin: Okay. You want the P52 done at that attitude with the new REFSMMAT? To break down and restate the steps that McCandless has just read out: After breakfast and a purge of the fuel cells, they will swap out a lithium hydroxide canister for the sixth time. Exhausted canister number 6 will be stored in a liner within compartment B6. After the ascent stage returns from the Moon and before it is jettisoned, that liner full of canisters will be placed in its cabin to be discarded with it. Meanwhile the rock boxes from the Moon will be placed in B5 and B6 for the journey to Earth. Next, they will get an abort PAD with details of a contingency burn to bring them home in the circumstance that they do not fire the SPS to enter lunar orbit. The burn defined in this PAD would occur 2 hours after their closest approach and expedites the return journey. At around 73 hours, as their barbecue roll brings them around to an angle of zero, they should stop the roll and perform a P52 platform realignment based on their current REFSMMAT. This allows engineers to see how far the platform has drifted since their previous P52. With that out of the way, Mission Control will uplink three items; a new REFSMMAT, a fresh state vector, and targeting details for the main burn that will insert them into lunar orbit, the Lunar Orbit Insertion (LOI) burn. The new REFSMMAT is one that is calculated to coincide with the spacecraft's attitude at LOI, a technique that will make the attitude displays easy to interpret, especially if the crew have to take over attitude control during that burn. At this point, they will manoeuvre to an attitude of zero on all axes and Mike should then carry out another P52 but this one will realign the platform's orientation per the new REFSMMAT. Mission Control have included the angles to which the High Gain Antenna ought to be pointed to give a good radio link with Earth. 071:12:35 McCandless: Apollo 11, this is Houston. Over. 071:12:41 Collins: Houston, go ahead. 071:12:42 McCandless: Roger, 11. Correction on my last. At 73:20, we uplink you the new REFSMMAT. And at 73:30, we'd like you to maneuver to 0 roll, 0 pitch, 0 yaw in the old REFSMMAT. And then torque around to the new REFSMMAT and run your P52 option 1 in that same inertial attitude. Over. 071:13:15 McCandless: And I've got a consumables update, when you're ready to copy. 071:13:22 Collins: I just got up, but you didn't catch me on that one. 071:13:55 Aldrin: Okay. We're ready to copy that consumable update. 071:14:49 Aldrin: Roger. And our readouts on board are Alpha is 82, Bravo is 84, Cocoa is 84, and Delta is 87. 071:15:09 McCandless: Houston. Roger. Out. 071:15:14 Aldrin: And you want us to cycle the O2 and H2 fans, I imagine? 071:15:24 McCandless: 11, this is Houston. Affirmative. Over. 071:23:26 Aldrin: Houston, Apollo 11. I have a status report for you. 071:23:34 McCandless: Go ahead, 11. 071:23:38 Aldrin: Roger. On sleep, CDR, CMP 7.5, LMP 6.5. Over. 071:23:46 McCandless: Roger. 7.5 for each. Over. 071:23:54 Aldrin: Negative. LMP 6.5. 071:24:14 Aldrin: Okay. We're ready to listen. 071:25:37 Armstrong: Apollo 11. Roger. We got all that. The engine of the Service Propulsion System is designed to be extremely reliable. Central to that design is the use of hypergolic propellants (forms of hydrazine and nitrogen tetroxide). These two substances will ignite upon contact with each other. Rather than using pumps to feed the propellants into the combustion chamber, engineers decided to have the pressure in the tanks be sufficient to overcome the pressure of combustion. Between the tanks and the injector, just about everything was duplicated; plumbing, valves, control systems, giving the crew redundant paths for engine ignition. These were called Bank A and Bank B. Each on its own could operate the engine but if the valves on both were opened simultaneously, then the propellants had an easier route to take to the injector under pressure from the tanks. In this circumstance, with slightly more propellant reaching the injector, then combustion was a little more vigorous and its pressure a little higher. therefore thrust would also be higher because it depended on combustion pressure. It was usual for long burns of the SPS that the computer would be given control over one bank. Then shortly after ignition, the second bank would be manually brought into play to bring the engine to its rated thrust. This is Apollo Control at 71 hours, 31 minutes. Apollo 11's distance from the Moon now 11,232 nautical miles [20,802 km]. Approaching at a velocity of 4,141 feet per second [1,262 m/s]. 071:33:08 Aldrin: Houston. Apollo 11. [Garble]. 071:33:40 McCandless: Apollo 11, this is Houston. Go ahead. Over. 071:33:47 Armstrong: Houston, do you read Apollo 11? 071:33:49 McCandless: Roger, 11. We're reading you loud and clear now. We were down in the noise as we switched antennas a minute or so ago. Over. 071:34:00 Aldrin: Roger. What sort of settings could you recommend for that solar corona? We've got the Sun right behind the edge of the Moon now. 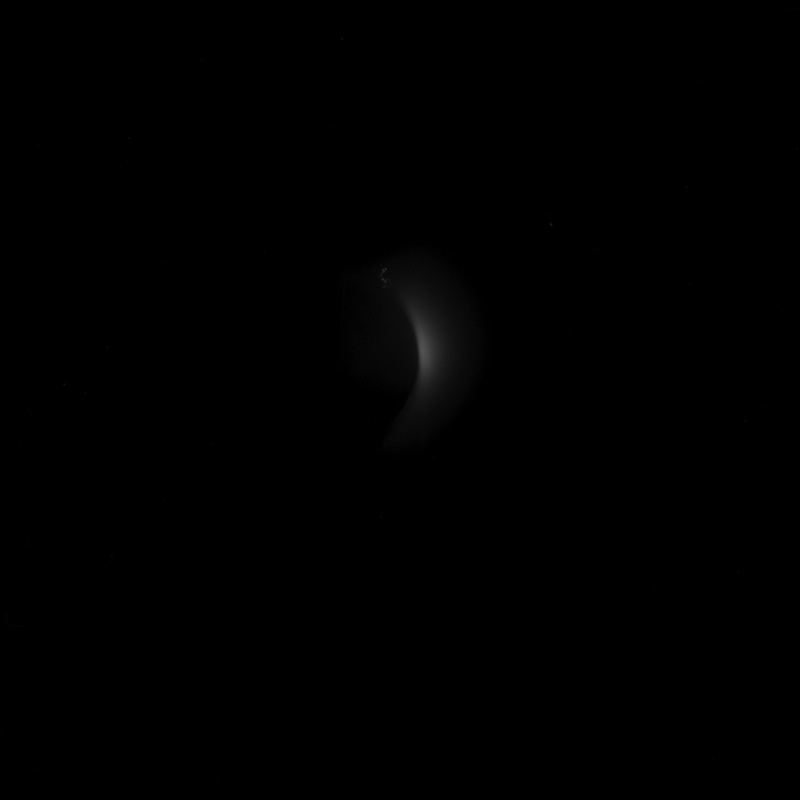 071:34:16 Aldrin: It's quite an eerie sight. There is a very marked three-dimensional aspect of having the Sun's corona coming from behind the Moon the way it is. 071:35:40 McCandless: Apollo 11, this is Houston. Over. 071:35:47 McCandless: Roger. If you'd like to take some pictures, we recommend using magazine Uniform which is loaded with high speed black and white film, interior lights off, electric Hasselblad with the 80-millimeter lens. And you're going to have to hand-hold this, I guess. We're recommending an f-stop of 2.8, and we'd like to get a sequence of time exposures. Over. 071:36:24 Aldrin: Okay. You want magazine Uniform instead of magazine Tango? Over. 071:36:30 McCandless: Roger. We're not trying to get you all wrapped up in a procedure here. This is on a not-to-interfere basis, of course. Over. 071:36:46 McCandless: And on the exposures we're looking for an eighth of a second, a half a second. And, if you think you can steady the camera against anything to get longer exposures, 2 seconds, 4 seconds, and 8 seconds. Over. 071:37:11 Aldrin: Roger. We copy. 071:39:15 McCandless: Apollo 11, Houston. Over. 071:39:23 Aldrin: Go ahead, Houston. 071:39:25 McCandless: Roger. We'd like to do a little cryo tank balancing. So, if you could position the Oxygen Tank number 1 heater switch to Off and Hydrogen Tank 2 heater switch to Off, leaving all the rest of the cryo switches the same, we'll let it run that way for a few hours. Over. 071:39:48 Collins: Okay. Stand by one, on those switches. We'll get them in a minute. 071:40:13 Armstrong: Well, its a bit like zodiacal light. It keeps going out farther and farther. We'll talk about it a little more later. 071:43:11 Armstrong: We've got quite a few pictures [garble] windows [garble] corresponding [garble]. In all, the crew appears to have made 44 attempts to take images of the solar corona. 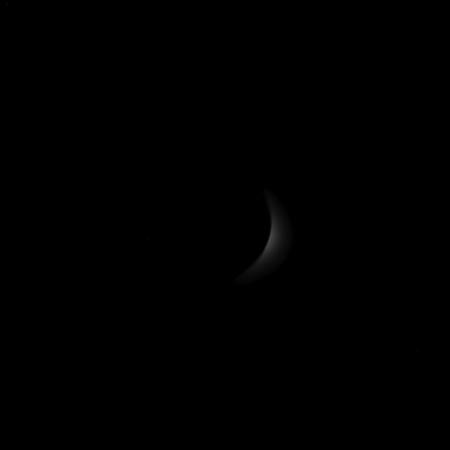 Many of the available scans are very dark but the following six are a selection of those images that have something to show. AS11-42-6167 - Solar corona appearing from behind the Moon. Image by LPI. 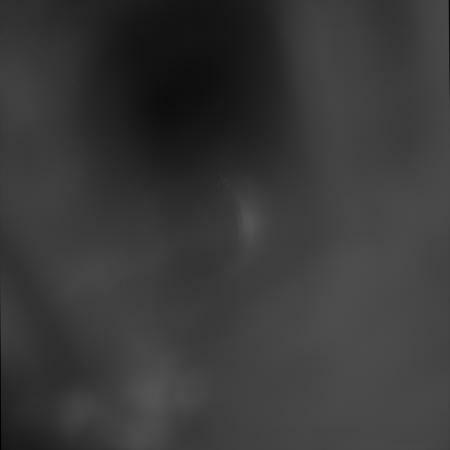 AS11-42-6168 - Fogged image of the solar corona appearing from behind the Moon. Image by LPI. AS11-42-6179 - Solar corona appearing from behind the Moon. Lunar features appear to be visible illuminated by Earth's light, particularly Mare Imbrium and the ray systems of Copernicus and Kepler. Image by LPI. AS11-42-6195 - Solar corona appearing from behind the Moon. Image by LPI. AS11-42-6200 - One of the shorter exposures of the solar corona appearing from behind the Moon. Image by LPI. AS11-42-6202 - Solar corona appearing from behind the Moon. Image by LPI. 071:44:48 Collins: Houston, Apollo 11. Understand you want the heaters Off for Hydrogen Tank 1 and Oxygen Tank 1. Is that affirmative? 071:44:56 McCandless: That's negative, Mike. Hydrogen Tank number 2 heaters, Off, and Oxygen Tank number 1 heaters, Off. 071:45:12 Collins: I have Hydrogen Tank number 2 heaters, Off. I have Oxygen Tank number 1 heaters, Off. As their contents are drawn off, the pressures and temperatures within the cryogenic tanks will fall. As a counter to that, heat leaking in from outside will raise both values. In order to maintain the pressure within a desired range for feeding the spacecraft's systems, heaters are installed within the tanks to supplement the heat leakage. In this case, it appears that H2 tank 2 and O2 tank 1 are a little higher in pressure than the other two so the automatic systems for their heaters is being switched off to allow the tanks to equalise with the others. 071:52:15 Collins: Houston. Apollo 11. The Earthshine coming through the window is so bright you can read a book by it. 071:52:24 McCandless: Oh, very good. That was Mike Collins reporting. 071:56:00 Armstrong: And, Houston, I'd suggest that along the ecliptic line we can see corona light out to two lunar diameters from this location. The bright light only extends out about an eighth to a quarter of the lunar radius. They are currently about 19,000 km from the Moon. The Moon's diameter is 3,474 km. At their current distance, its angular diameter is about 10 degrees. In comparison, the Sun's angular diameter as seen from the Earth or Moon is about 0.5 degrees. The fact that Neil sees the corona coming out along the ecliptic suggests that this is the zodiacal light. 071:56:35 McCandless: Roger. Understand that you can see the corona approximately 200 solar diameters out along the ecliptic, and the bright light extends out approximately one-eighth to one-quarter lunar radius. Over. McCandless may be trying to use mental arithmetic to convert two lunar diameters to its equivalent in solar diameters. The correct answer is about 40 solar diameters. 071:56:52 Armstrong: That's two lunar - two lunar diameters along the ecliptic in the bright part - [perhaps acknowledging a suggestion from either Aldrin or Collins] right - [To McCandless] a quarter to an eighth of a lunar radius out, and that's perpendicular to the ecliptic line on the South Pole. That last transmission was from Neil Armstrong. 071:59:20 Armstrong: Houston, it's been a real change for us. Now we're able to see stars again and recognize constellations for the first time on the trip. It's - the sky is full of stars. Just like the night side of Earth. But all the way here, we've only been able to see stars occasionally and perhaps through the monocular, but not recognize any star patterns. 071:59:52 McCandless: I guess it's turned into night up there really, hasn't it? 072:04:57 McCandless: 11, this is Houston. Go ahead. Over. This is Apollo Control at 72 hours, 7 minutes. Apollo 11 is 9,761 nautical miles [18,077 km] from the Moon. Velocity; 4,217 feet per second [1,285 m/s]. Weight; 96,012 pounds [43,550 kg]. 072:14:38 McCandless: Apollo 11, this is Houston. How do you read? Over. 072:14:43 Armstrong: Okay. We went to the High Gain. Looks like you had a little trouble getting signal strength there. 072:14:49 McCandless: Roger. We missed an Omni switch there. Over. 072:15:30 McCandless: Apollo 11, this is Houston. We believe that's normal system operation. The radiators are expected to be very cold right now and apparently the decrease you saw was due to contraction in the fluid. Over. 072:15:49 Armstrong: Okay. We'll go ahead with the procedure just as if there were no decrease in accumulator quantity. Right? 072:15:55 McCandless: Roger. Press on. 072:17:25 Armstrong: And, Houston, the secondary radiator flow check is complete and satisfactory. 072:17:40 Collins: And that's a good deal because we don't have to have any meetings about whether we're going to do it or don't do it any more. That was a Mike Collins' comment. 072:20:17 Aldrin: Houston, Apollo 11. Ready to copy pericynthion-plus-2. 072:21:48 Aldrin: Roger. SPS/G&N: 62710, plus 0.98, minus 0.19; 077:46:22.48; plus 3214.8, minus 0045.5, minus 1037.7; NA, 307; Vega and Deneb; 243, 183, 012; no ullage. Landing site REFSMMAT, docked. And ya'aven't - change on the LM weight. Over. 072:22:30 McCandless: No change in the LM's weight - in the LM weight, and the readback is correct. Out. 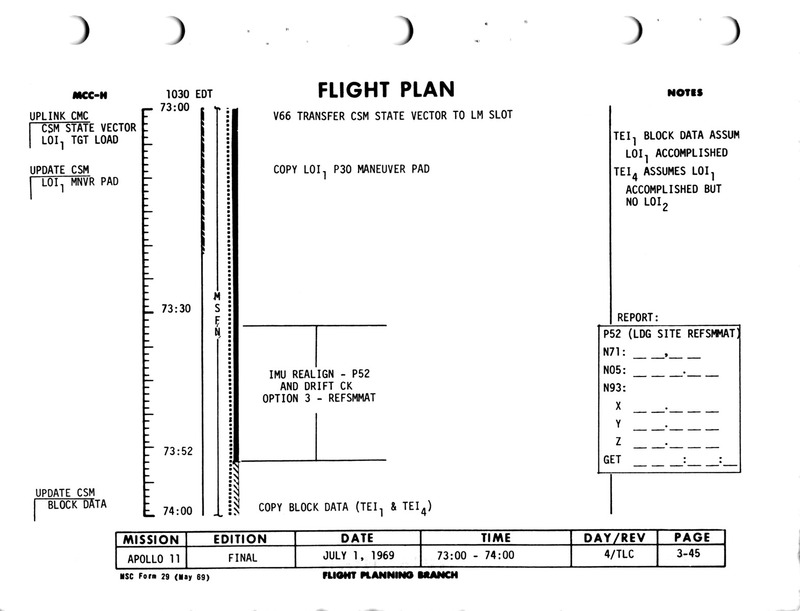 Purpose: This PAD provides the details of a contingency burn of the SPS engine that would be executed two hours after the point of closest approach to the Moon, the pericynthion. This is in case they do not carry out the LOI burn and have elected to continue to Earth. The burn would set then on an accurate course for re-entry to Earth's atmosphere and would bring them home a day earlier than would be the case otherwise. Systems: The burn would be made using the large SPS engine at the rear of the Service Module, under the control of the Guidance and Navigation system. CSM mass (Noun 47): 62,710 pounds (28,445 kg). Pitch and yaw trim (Noun 48): +0.98° and -0.19°. The SPS engine is mounted on gimbals and can be aimed so that its thrust vector (the direction in which it pushes) acts through the spacecraft's centre of mass. These angles represent a calculated direction for these gimbals. They will only be used if the crew need to control the burn manually using the Stabilization Control System (SCS). In a normal automatic burn, the TVC (Thrust Vector Control) system automatically adjusts these angles for shifts in the stack's centre of mass. Time of ignition (Noun 33): 77 hours, 46 minutes, 22.48 seconds. Change in velocity (Noun 81), fps (m/s): x, +3,214.8 (-979.9); y, -45.5 (+13.9); z, -1,037.7 (-316.3). The change in velocity is resolved into three components which are quoted relative to the LVLH (Local Vertical/Local Horizontal). The large negative component indicates the largely retrograde nature of the burn. Spacecraft attitude: Roll, NA; Pitch, 307°. The desired spacecraft attitude is measured relative to the alignment of the guidance platform. In this case, the platform will be assumed to have been aligned per the landing site REFSMMAT. This REFSMMAT is the same as the attitude of the landing site at the expected time of landing and parallel to the approach direction. Other items in the PAD are not applicable until we get to the backup method of aligning the GDCs. GDC Align stars: Should the IMU fail to provide a trustworthy attitude reference, the crew can use the spacecraft's other gyros (the BMAGs) and their associated Gyro Display Couplers as a reference. To align these, the spacecraft is rotated so as to place Vega and Deneb against the telescope's graticule (or reticle) in a predetermined fashion. If they were to do so, the spacecraft's attitude with respect to the desired REFSMMAT would be 243°, 183°, and 12° in roll, pitch and yaw respectively. Those values can be entered into the GDCs to provide the necessary starting point for their attitude measurements. Additional notes remind them which REFSMMAT is assumed and that they would be expected to have the LM still docked. 072:25:06 McCandless: Apollo 11, this is Houston. Over. 072:25:13 Armstrong: Roger. Go ahead. 072:25:14 McCandless: Roger. We're having difficulty getting commands into the spacecraft. We'd like you to cycle your Up Telemetry switch to Command Reset and Off and then back to Normal. Over. 072:26:02 McCandless: Negative. We'd like to stay on the High Gain if we can. Over. Based on image measurement and triangulation, It seems a photo of Earth is taken at about this time. AS11-36-5402 - Earth at about 378,000 km or 204,000 nautical miles. North is right. The African continent dominates the view with the Mediterranean Sea, Arabia and Iran also clear. Image by LPI. 072:27:25 McCandless: Roger. We'd like you to switch to Omni Delta as we show you approximately at the scan limit of the High Gain Antenna. We will then command Omni Delta down here after you advise us you've switched, and then you can select Bravo on board and we'll be back in the Omni antenna commanding business. Over. 072:28:16 McCandless: 11, Houston. You can go ahead and select Omni Bravo on board now. 072:28:24 Armstrong: You have it. 072:29:24 McCandless: Apollo 11, this is Houston. If you have a minute or so free, we can read you up the morning news here. 072:29:35 Armstrong: Go right ahead, let's hear it. From this point, McCandless takes turns with backup LMP Fred Haise in reading up the news. 072:29:46 Haise: Okay. First off, looks like it's going to be impossible to get away from the fact that you guys are dominating all the news back here on Earth. Even Pravda in Russia is headlining the mission and calls Neil, the Czar of the Ship. I think maybe they got the wrong mission. Pravda was the main official newspaper, the organ of the Central Committee of the Communist Party of the Soviet Union. 072:30:06 McCandless: West Germany has declared Monday to be Apollo Day. School children in Bavaria have been given the day off. Post Office clerks have been encouraged to bring radios to work and Frankfurt is installing TV sets in public places. 072:30:24 Haise: BBC in London is considering a special radio alarm system to call people to their TV sets in case there is a change in the EVA time on the Moon. 072:30:35 McCandless: And in Italy, Pope Paul VI has arranged for a special color TV circuit at his summer residence in order to watch you, even though Italian television is still black and white. Ironically, the moon walk would only be broadcast in black-and-white, although orbital TV from Apollo 11 was in colour. 072:30:48 Haise: Back here in Houston, your three wives and children got together for lunch yesterday at Buzz's house. And according to Pat, it turned out to be a gab-fest. The children swam and did some high jumping over Buzz's bamboo pole. 072:31:11 McCandless: In Moscow, space engineer Anatol Koritsky was quoted by TASS as saying that Luna 15 could accomplish everything that had been done by earlier Luna spacecraft. This was taken by the press to mean Luna 15 could investigate the gravitational field, photograph the Moon, and go down to the surface to scoop up a bit for analysis. 072:31:35 Haise: Even the kids at camp got in the news when Mike Junior was quoted as replying 'yeah' when somebody asked him if his daddy was going to be in history. Then after a short pause he asked: 'What is history?' In Washington, President Nixon is planning to use his executive power to streamline the Interstate Commerce Commission. According to the industry sources, it was reported Nixon would trim the commission from 11 to 7 members by not making new appointments. 072:32:12 McCandless: And the big news around Houston today concerns the Astros. In the sports world, the Houston Astros rallied in the ninth inning at Cincinnati to dump the Reds 7 to 4. Going into the ninth however, things looked pretty bleak: the Astros were trailing 4 to 3. Then with one out, Jesus Alou stroked a single to right field. John Edwards hit another single to right, and Sandy Valdespino hit a double to bring in the tying run. Julio Gotay was walked and Joe Morgan dropped a bunt for the game-winning play. A wild throw to the plate allowed another run to score, then a sacrifice fly by Dennis Menke brought in the final run. They really came through in the ninth. 072:32:57 Collins: Yes. Those Astros have really been catching those flies since they put a roof on the stadium. 072:33:19 Haise: In other games in the National League, New York beat Montreal 5 to 2; Pittsburgh beat St. Louis 4 to 1; and Atlanta over San Diego in the first game of a double header, 6 to 2. 072:33:32 McCandless: In the American League, Detroit beat Cleveland 4 to nothing; New York trounced Washington 5 to nothing; Baltimore out hit - Boston out hit Baltimore to score 6 runs to the Orioles' 2; and Chicago beat Kansas City 6 to 1. 072:33:50 Haise: Okay. In golf world, Tommy Jacobs, an infrequent competitor in recent years, took the lead in the Philadelphia Golf Classic yesterday. His second round score was 139. 072:34:02 McCandless: You might be interested in knowing, since you are already on the way, that a Houston astrologer, Ruby Graham, says that all the signs are right for your trip to the Moon. She says that Neil is clever, Mike has good judgment, and Buzz can work out intricate problems. She also says Neil tends to see the world through rose-colored glasses, but he is always ready to help the afflicted or distressed. Neil, you are also supposed to have, quote, intuition that enables you to interpret life with feeling, unquote. Buzz is to be very sociable and cannot bear to be alone in addition to having excellent critical ability. Since she didn't know at what hour Mike was born, she has decided that he either has the same attributes as Neil or he is inventive with an unconventional attitude that might seem eccentric to the unimaginative. 072:34:58 Collins: Who said all that? 072:35:49 Armstrong: Houston, 11. You're cutting out [garble]. 072:35:56 McCandless: Apollo 11, Apollo 11, this is Houston. We're switching Omnis. Can you stand by for about 2 minutes? 072:37:30 Armstrong: Houston, 11. Radio check. 072:37:35 Haise: 11, Houston. Go ahead. 072:37:41 Armstrong: Roger. You cut out after Tommy Jacobs and I guess we got into antenna switching problems. 072:37:49 McCandless: Okay. Following Tommy Jacobs, we have the hot smoking word from a local Houston astrologer by the name of Ruby Graham. She says that all the signs are right for your trip to the Moon. Neil is clever, Mike has good judgement, and Buzz can work out intricate problems. She also says Neil tends to see the world through rose-colored glasses but is always ready to help the afflicted or distressed. Neil, you are also supposed to have, quote, intuition that enables you to interpret life with feeling, unquote. Buzz is supposed to be very sociable and cannot bear to be alone in addition to having excellent critical ability. Since she didn't know at what hour Mike was born, she's decided he either has the same attributes as Neil or that he is inventive with an unconventional attitude that might seem eccentric to the unimaginative. And that's 30 for today. Over. 072:38:51 Armstrong: Thank you much there, Bruce and Fred Show, we appreciate that. That was Fred Haise alternating with Bruce McCandless on that newscast. 072:39:13 Collins: Did you hear our comment about the Astros? 072:39:17 McCandless: The one about the roof? 072:40:00 Aldrin: You got him on that one. 072:40:03 Armstrong: I think they're just getting to be a good team in the clinch. 072:40:05 McCandless: They certainly seem to be. 072:40:11 Collins: Well, if they can do that well without a roof, think of what they're going to do with a roof. 072:41:23 Collins: You tell Michael Junior, history or no history, he'd better behave himself. 072:41:29 McCandless: Roger. We'll pass that along, Mike. This is Apollo Control at 72 hours, 45 minutes. Apollo 11 is now 8,188 nautical miles from the Moon, approaching at a velocity of 4,324 feet per second. 072:48:58 McCandless: Apollo 11, Houston. If it's convenient with you, we have an LOI-1 PAD that we can pass up to you now. Over. 072:50:37 McCandless: Apollo 11, this is Houston. When you stop at 0 roll, you'll be in approximately 90 pitch, 0 yaw, and 0 roll. We'd like you to run the first P52, that is, the P52 option 3, from that attitude. Then we'll uplink you a new REFSMMAT, either before or while you're maneuvering to 000, then you can torque the platform around and run the second REFSMMAT. Over. Run the second P52. Over. 072:51:15 McCandless: And I copied you're ready for the LOI-1 PAD. Over. 072:51:24 McCandless: LOI-1, SPS/G&N: 62710, plus 0.98, minus 0.19, GET ignition 075:49:49.65; minus 2889.7, minus 0394.4, minus 0068.6; roll 358, pitch 226, 347; 0169.2, plus 00610; 2917.3, 6:02, 2910.8; sextant star 31, 1066, 358. Remainder of the PAD is NA. GDC align, Vega and Deneb, 243, 183, 012. No ullage. The horizon will be visible just below the upper edge of the hatch window 2 minutes prior to the LOI burn. It will not be visible in the rendezvous window on the left-hand side. LOS at 75 hours, 41 minutes, 23 seconds. AOS at 76:15:29. AOS without the LOI burn, 76:05:30. The values which you would see on Noun 42 prior to LOI burn are HA, plus 431.3; HP, minus 128.2. Read back, over. 072:53:54 Armstrong: Roger. LOI-1, SPS/G&N: 62710, plus 0.98, minus 0.19; 075:49:49.65; minus 2889.7, minus 0394.4, minus 0068.6; 358, 226, 347; 0169.2, plus 0061.0; 2917.3, 6:02, 2910.8; 31, 106.6, 35.8. GDC align, Vega and Deneb, 243, 183, 012. No ullage. Horizon in the hatch window 2 minutes before TIG. AOS with an LOI, 76:15:29; AOS without an LOI, 76:05:30. HA before the burn, 431.3; HP, minus 128.2. Say again LOS time. Purpose: This PAD gives the parameters for Lunar Orbit Insertion burn 1. This burn will Apollo 11 enough to cause it to be captured in orbit around the Moon. A second burn will be made after two revolutions to refine their orbit. Systems: The burn will be made using the large SPS (Service Propulsion System) engine at the rear of the Service Module, under the control of the Guidance and Navigation system. CSM Weight (Noun 47): 62,710 pounds (28,445 kg). Time of ignition, TIG (Noun 33): 75 hours, 49 minutes, 49.65 seconds. Change in velocity (Noun 81), fps (m/s): x, -2,889.7 (-880.8); y, -394.4 (-120.2); z, -68.6 (-20.9). The change in velocity is resolved into three components expressed relative to the Local Vertical/Local Horizontal frame of reference. Spacecraft attitude: Roll, 358°; Pitch, 226°; Yaw, 347°. The desired spacecraft attitude is measured relative to the alignment of the guidance platform. 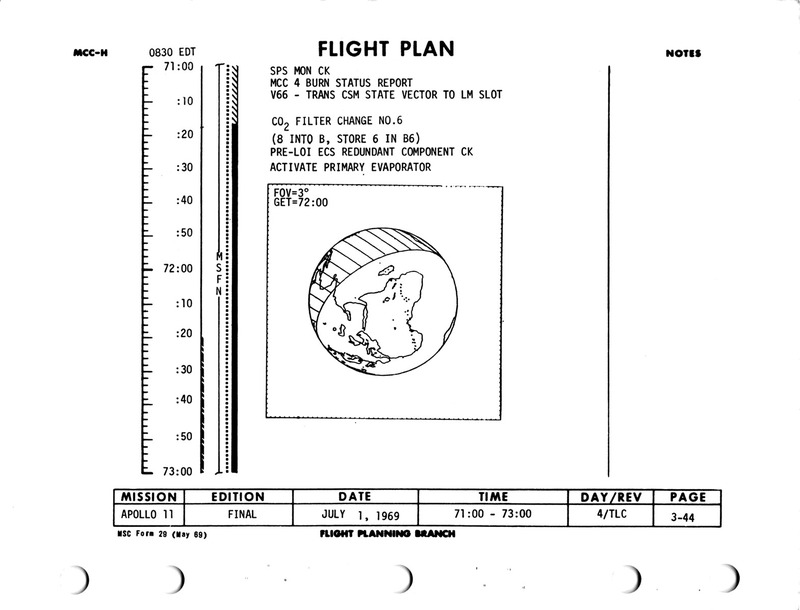 The current alignment of the platform was set prior to their entry into lunar orbit and was calculated to match the orientation, in space, of the landing site at the time of landing. This orientation is called the 'Landing Site REFSMMAT'. This is interestingly different from both earlier and later flights. It was more usual on Apollo for the LOI burns to be made using a REFSMMAT specifically calculated for them. This was arranged so that the FDAI displays would read 0,0,0 during the burns which made them easier to interpret. LOI needed to be accurate to avoid the possibility of a wayward burn taking the spacecraft into the Moon's surface. HA, expected apocynthion of resulting orbit (Noun 44): 169.2 nautical miles (313.4 km). HP, expected pericynthion of resulting orbit (Noun 44): 61.0 nautical miles (113.0 km). The pericynthion will be over the Moon's far side, at roughly the same position that LOI occurred; with the apocynthion occurring over the near side. Burn duration or burn time: 6 minutes, 2 seconds. Delta-VC: 2,910.8 fps (887.2 m/s). This value is entered into the Delta-V display of the EMS (Entry Monitor System) panel. They will watch this figure descend to zero as the engine burns. If the Guidance and Control System fails to stop the burn, the EMS will do so but it has to be given a low Delta-V figure to take account of the engine's tail-off thrust after shutdown. Sextant star: Star 31 (Arcturus, or Alpha Bootes) visible in sextant when shaft and trunnion angles are 106.6° and 35.8° respectively. This is part of an attitude check. GDC align stars: Stars to be used for GDC align purposes are Vega and Deneb. The align angles are roll, 243°; pitch, 183°; yaw, 12°. The purpose of this is to allow their backup gyros to be aligned in case the IMU fails. By viewing these two stars through the telescope and adjusting the spacecraft's attitude so they align with the reticle or graticule in a certain way, the crew will know they are in the attitude stated, and can pass this onto the GDCs, the box of electronics that makes sense of the gyros. The SPS propellant tanks are full, so there is no need to perform an ullage burn to settle their contents. The next comment refers to where in the rendezvous window the commander can expect to see the Moon's horizon, and when this occurs. Usually, this is with respect to a series of lines scribed on the window but in this case, the upper edge of the window is being used. It is a coarse check of the spacecraft's control system. Next come three times for when the crew can expect to loose their radio link with Earth, when they will reacquire it if the burn goes as planned and when reacquisition occurs if they fail to make the burn. Finally come two altitudes, an apolune and a perilune, that they should see on their display prior to the burn. 072:55:47 McCandless: Roger. LOS time 75:41:23. Over. 072:56:03 McCandless: 11, this is Houston. Readback correct. Out. That was Neil Armstrong with the readback of the Lunar Orbit Insertion burn number 1 PAD. The ignition time for that burn; 75 hours, 49 minutes, 49 seconds. That's 2 hours, 57 minutes, 49 seconds from this time. Duration of that burn; 6 minutes, 2 seconds retrograde, and the change in velocity; 2,917.3 feet per second [889.2 m/s]. The expected orbit following that maneuver is 169.2 by 61 nautical miles [313.4 by 113.0 km]. To repeat the LOS/AOS times; we will lose signal with Apollo 11 at 75 hours, 41 minutes, 23 seconds as it goes behind the Moon. Given a successful Lunar Orbit Insertion number 1 burn, we will acquire the signal at 76 hours, 15 minutes, 29 seconds. If for some reason Apollo 11 cannot perform the burn, we will acquire the spacecraft at 76 hours, 5 minutes, 30 seconds. 073:04:38 McCandless: Apollo 11, this is Houston. Over. 073:04:44 McCandless: Roger. Apparently we missed getting your onboard readouts on battery Charlie and Pyro batteries Alpha and Bravo last night. I wonder if you could give us some fresh numbers. Over. 073:04:59 Armstrong: You want the readings now? 073:05:16 Aldrin: Okay. All three of the them are still 37.1 [Volts]. 073:05:20 McCandless: Roger. 37.1 cubed. Out. This is Apollo Control at 73 hours, 6 minutes. Apollo 11's distance from the Moon is now 7,331 nautical miles [13,577 km]. Velocity; 4,399 feet per second [1,341 m/s]. The ignition time passed up to the crew on this PAD is 4 minutes, 39 seconds earlier than the LOI-1 time published in the Flight Plan prior to lift-off. 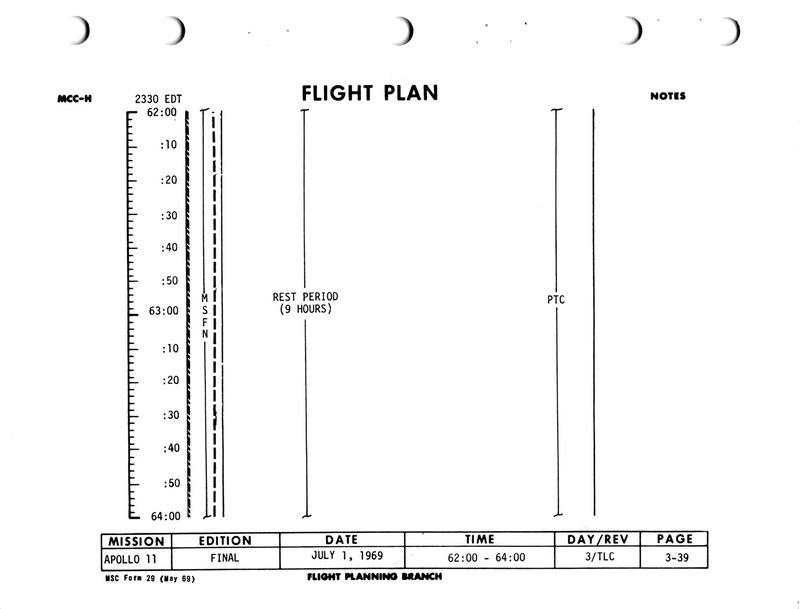 This means that all lunar events will move forward from the published Flight Plan times by this amount of time - 4 minutes, 39 seconds. 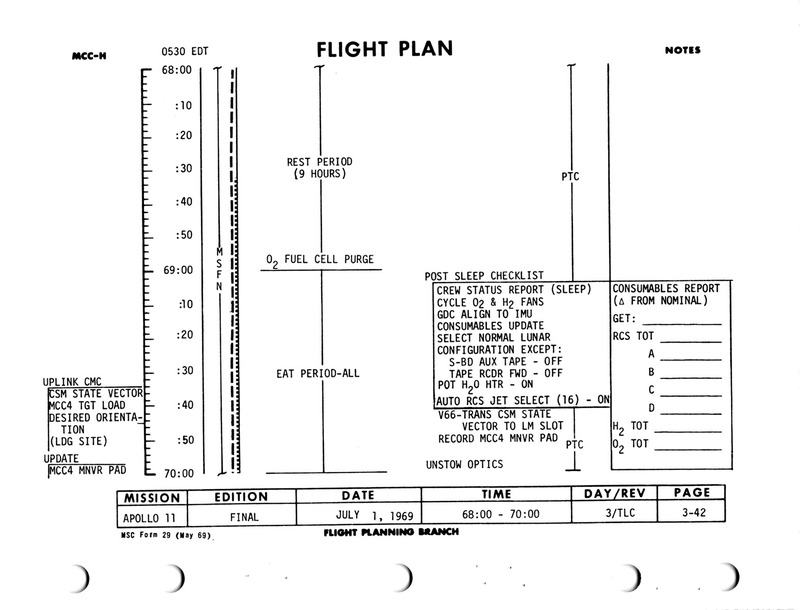 This time will be made up during the trans-Earth coast, and splash should occur at the Flight Plan time. This is Mission Control, Houston. 073:09:14 Collins: Houston, Apollo 11. The P52 option 3 is complete. We're maneuvering to 000. This first of two P52 platform realignments has been carried out just to allow engineers to gain a measurement of the platform's tendency to drift. For this P52, he used star 40 (Altair, Alpha Aquilae) and 45 (Fomalhaut, Alpha Piscis Austrini). The angles by which the platform must be torqued to restore a perfect orientation (i.e. how far it had drifted) are 0.285° in X, 0.281° in Y and minus 0.006° in Z. The star angle difference was 0.01°, this being the difference between two angles; the actual angle between the two stars and the same angle, but as measured by Mike's sightings. 073:09:20 McCandless: Roger. We observe your maneuvering, and we'll have some uplinks for you in a couple of minutes here. 073:13:13 McCandless: Apollo 11, this is Houston. We observe you're in P00. If you'll give us Accept, we'll start our uplinks. 073:13:24 Collins: You got it, Houston. 073:16:51 McCandless: Apollo 11, this is Houston. Over. 073:16:58 Armstrong: Go ahead, Houston. 073:16:59 McCandless: Roger. We're on low bit rate at the present time so it's going to take us a little bit longer than normal to get this stuff up to you. Over. 073:17:12 Armstrong: I guess we're in no rush. 073:17:24 Armstrong: The view of the Moon that we've been having recently is really spectacular. It fills about three-quarters of the hatch window, and of course, we can see the entire circumference, even though part of it is in complete shadow and part of it's in Earthshine. It's a view worth the price of the trip. 073:18:11 Armstrong: One of these days, we'll be able to bring the whole MOCR along, I hope. Save a lot of antenna switching. 073:18:21 McCandless: Say again, 11. 073:18:26 Armstrong: One of these days, we could bring the whole MOCR along, and then that'll save a lot of antenna switching. The MOCR is the Mission Operations Control Room. That's the control center here. 073:20:21 McCandless: Apollo 11, this is Houston. Over. 073:20:28 Collins: Go ahead, Houston. 073:20:32 Collins: The Czar is brushing his teeth, so I'm filling in for him. 073:20:36 McCandless: Say again, please. 073:20:42 Collins: I said the Czar is brushing his teeth, so I'm filling in for him. What can we do for you? 073:20:47 McCandless: Roger. Well, if you don't get in the way of the Czar while he's brushing his teeth, we'd like you to bring up the primary accumulator quantity a little bit. We're showing the quantity now at 20.6 percent on TM. Seems to have gone down a bit since you've gone into the shadow. We'd like it serviced to bring the quantity up to between 30 and 40 percent, preferably 35 percent. Over. 073:21:23 McCandless: The computer is yours, 11. The loads are in and verified. You can go back to Block. 073:21:31 Collins: We're in Block. 073:23:52 McCandless: 11, this is Houston. On the basis of your last P52 alignment, the platform looks like it's indeed performing very well. No problems there, no updates required, and no PIPA bias update is required either. Over. This is Apollo Control at 73 hours, 25 minutes. Apollo 11 is 6,522 nautical miles [12,079 km] away from the Moon; approaching at a velocity of 4,483 feet per second [1,366 m/s]. 073:40:51 Collins: Houston, Apollo 11. Radio check. 073:40:54 McCandless: 11, this is Houston. Loud and clear. Over. 073:41:00 Collins: Okay. Just checking. Do you want the High Gain? 073:41:06 McCandless: Roger. If you can give it to us. 073:42:19 Collins: Houston, Apollo 11. How do you read on the High Gain? 073:42:23 McCandless: Loud and clear on the High Gain. 073:42:29 Collins: Same here. We've completed the P52 option 1. 073:42:48 Collins: Glad to have you. Mike's second P52 at this part of the flight is meant to align the guidance platform with the new REFSMMAT, the landing site REFSMMAT. This orientation is calculated to match the orientation of the landing site at the time of landing. The X-axis runs from the Moon's centre through the landing site. The Z-axis runs parallel to the CSM's orbital plane and the Y-axis completes the set. 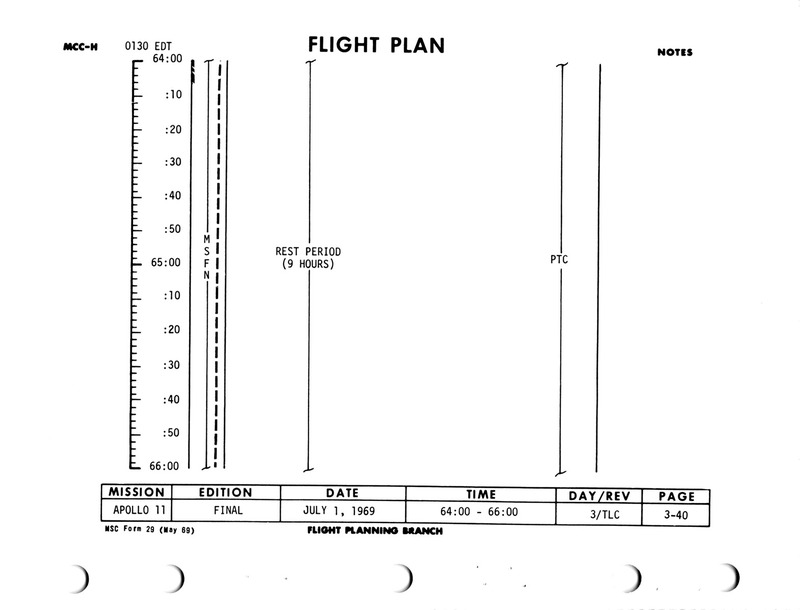 Were the LM to land at the correct time, in the right place and with no yaw to either side, then its FDAI would indicate zero degrees on all axes. For this P52, Mike's sightings were to star 06 (Acamar. Theta Eridani) and star 42 (Peacock, Alpha Pavonis). A small amount of torquing was required to get the platform exactly aligned, though these do not represent any degree of drift. The angles were -0.423° in X, +0.508° in Y and +0.111° in Z. The star angle difference was 0.01°, indicating that Mike's marking accuracy was good. 073:58:37 Aldrin: Houston, Apollo 11. Standing by to copy TEI-1 and TEI-4. Over. 073:59:44 Aldrin: Ready to copy. 074:01:53 Aldrin: Roger. TEI-1, SPS/G&N; 38658, minus 0.54, plus 0.65; 078:02:03.45; plus 2918.0, plus 0377.9, minus 0132.5; roll NA, pitch 041; two jets, 19 seconds; undocked. TEI-4: 38658, minus 0.54, plus 0.65, 084:29:50.59, plus 3137.3, plus 0376.0, minus 0096.8; roll NA, pitch 034; two jets, 19 seconds; undocked; assumes no LOI-2. 074:03:00 Aldrin: ...Apollo 11. Over. 074:03:01 McCandless: ...11, this is Houston. Readback correct. Out. That was Buzz Aldrin with the readback of that information which was for contingency Trans-Earth Injection burns if required shortly after Lunar Orbit Insertion. Purpose: This PAD would be used for a contingency Return-to-Earth burn after one orbit of the Moon. Systems: The burn would be made using the SPS (Service Propulsion System) engine under the control of the Guidance and Navigation system. CSM Weight (Noun 47): 38,658 pounds (17,535 kg). Pitch and yaw trim (Noun 48): -0.54° and +0.65°. The SPS engine is mounted on gimbals and can be aimed so that its thrust vector (the direction in which it pushes) acts through the spacecraft's centre of mass. These angles represent a calculated direction for these gimbals. They will only be used if the crew need to control the burn manually using the Stabilization Control System (SCS). In a normal automatic burn, the TVC (Thrust Vector Control) system automatically adjusts these angles for shifts in the stack's centre of mass. Time of ignition, TIG (Noun 33): 78 hours, 2 minutes, 3.45 seconds. Change in velocity (Noun 81), fps (m/s): x, +2,918.0 (+889.4); y, +377.9 (+115.2); z, -132.5 (-40.4). These velocities are expressed with respect to the Local Vertical/Local Horizontal frame of reference of the Moon. The large prograde value for X shows that this burn would increase their velocity in their direction of motion around the Moon. It is interesting, however, to view such a burn with respect to Earth. The Moon's velocity in its orbit is about 1 kilometre per second.  This burn would result in a change of velocity that is also about 1 kilometre per second but the direction of the burn is approximately opposite the direction of the Moon's orbital motion. In other words, seen with respect to Earth, this burn would bring the spacecraft to a near halt and the result would be that the Moon would slide away beneath it as it begins its fall to Earth. Spacecraft attitude: Roll, NA; Pitch, 41°. The desired spacecraft attitude is measured relative to the alignment of the guidance platform which itself has been aligned to the lunar landing site REFSMMAT. To settle the contents of the propellant tanks, a ullage burn using two RCS (Reaction Control System) jets would last for 19 seconds. Purpose: This PAD would be used for a contingency Return-to-Earth burn after four orbits of the Moon. Pitch and yaw trim (Noun 48): -0.54° and +0.65°. Time of ignition, TIG (Noun 33): 84 hours, 29 minutes, 50.59 seconds. Change in velocity (Noun 81), fps (m/s): x, +3,137.3 (+956.2); y, +376.0 (+114.6); z, -96.8 (-29.5). Spacecraft attitude: Roll, NA; Pitch, 34°. The ullage burn to settle the contents of the propellant tanks is to fire two RCS (Reaction Control System) jets for 19 seconds. Additional notes for the PADs mention that the burns assume that the vehicle's have been undocked and only the CSM is coming back. The LM, with its full propellant tanks, is too heavy to be brought Earthward. Another comment concerns the LOI-2 burn. Their current plan is to carry out a large LOI burn (LOI-1) then, after two orbits, circularise their orbit with a much shorter burn (LOI-2). The TEI-4 PAD assumes that they have not carried out the LOI-2 burn. 074:04:30 Aldrin: Roger. Go ahead, Houston. 074:04:32 McCandless: Roger. At GET of 74:30, we'd like you to cycle the fans in all four Cryo tanks and position the heaters in all four Cryo tanks to the Auto position. We're doing this in advance of LOI in order to ensure that you don't have any destratification as a result of the burn, which might result in giving you a master Caution and Warning during the burn. Over. 074:05:08 Aldrin: Okay. Was that 74:30 you want us to cycle the heaters and turn - cycle the fans and turn all the heaters on? 074:05:16 McCandless: All the heaters to Auto; cycle the fans at 74:30, about 25 minutes from now. Over. This is Apollo Control at 74 hours, 8 minutes. Apollo 11 is 4,625 nautical miles [8,566 km] away from the Moon. Velocity; 4,765 feet per second [1,452 m/s]. 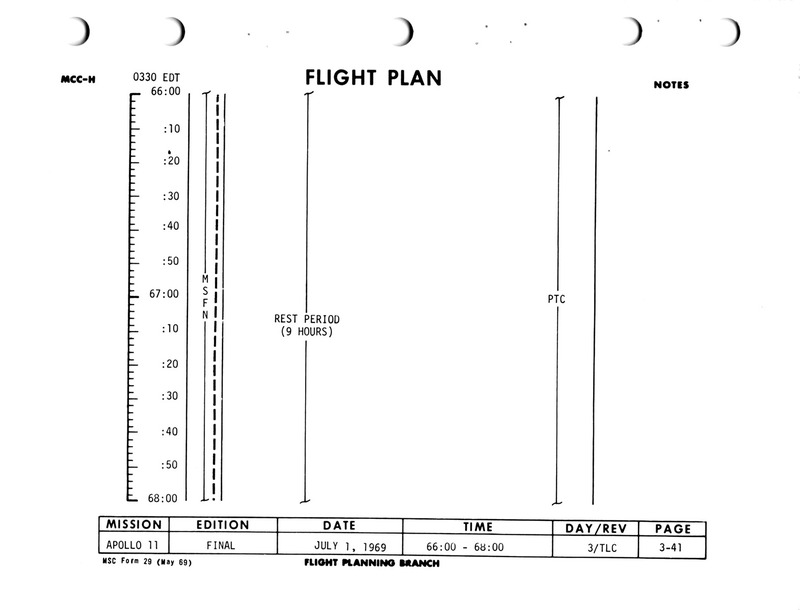 We're 1 hour, 32 minutes away from Loss Of Signal as Apollo 11 goes behind the Moon, and we're about 1 hour, 41 minutes away from the LOI number 1 burn. This is Apollo Control at 74 hours, 32 minutes. Apollo 11 is traveling at a velocity of 3 thousand... stand by. We've got a static display here. 074:34:44 McCandless: 11, this is Houston. Radio check. Over. 074:35:10 Armstrong: Houston, Apollo 11. 074:35:12 McCandless: Go ahead, 11. The TVC or Thrust Vector Control check is to ensure that the actuators that aim the gimbal-mounted SPS engine nozzle are working correctly. As a long burn progresses, the direction of the nozzle is constantly altered to keep the thrust acting through the centre of mass of the stack. If it doesn't do this then the spacecraft will tend to veer off the desired direction as the centre of mass shifts. Short term fluctuations in the spacecraft's attitude are dealt with by the RCS thrusters. 074:35:52 McCandless: 11, this is Houston. We're ready, except that we'd like to get the High Gain Antenna prior to this test. Over. 074:36:06 Armstrong: Can you give us a couple of pointing angles? 074:36:09 McCandless: Roger. From an attitude with 60 degrees roll, around to an attitude of roll 058 inertial. It would be pitch plus 30 and yaw 270 on the High Gain Antenna. 074:51:36 McCandless: Apollo 11, this is Houston. Do you read? Over. 074:51:43 Armstrong: Roger. Loud and clear. 074:51:45 McCandless: Roger. We're reading you weak but clear. 074:51:52 Armstrong: Roger. We put our - our roll for MSFN track in on the wrong sign. Going to continue rolling around until we get High Gain here. And, we'll delete the - the pitch that was scheduled after the TVC check. 074:52:15 McCandless: Say again please, 11. 074:52:25 Armstrong: ...for the roll correction to get MSFN High Gain, and we're continuing rolling around to get the proper attitude for High Gain at this time. We will delete the pitch maneuver that was scheduled subsequent to - subsequent to the TV check since we already have those pictures. 074:52:46 McCandless: Roger. We copy. And [pause] and we recommend that you go ahead and complete your TVC test on board. If you have problems, we'll talk to you when you get around further into the High Gain Antenna attitude. Over. 074:58:59 Armstrong: Houston, how do you read on High Gain? 074:59:02 McCandless: Oh, loud and clear on High Gain, 11. 074:59:07 Armstrong: Roger. We're proceeding. This is Apollo Control at 75 hours into the mission. Apollo 11 is 2,241 nautical miles away from the Moon. Velocity; 5,512 feet per second. We're 41 minutes away from Loss Of Signal as Apollo 11 goes behind the Moon. We're 49 minutes away from the Lunar Orbit Insertion maneuver number 1. 075:03:22 McCandless: Apollo 11, this is Houston. We observed your gimbal test down here, and it looked good to us. Over. 075:03:32 Armstrong: Roger. It looked good here. This is Apollo Control at 75 hours, 15 minutes into the mission. Apollo 11's distance from the Moon now is 1,516 nautical miles [2,808 km]; 1,516 nautical miles. Velocity; 5,981 feet per second [1,823 m/s]. 075:18:49 McCandless: Apollo 11, this is Houston. Radio check. Over. 075:18:55 Collins: Loud and clear. 075:18:56 McCandless: Roger. And your systems are looking good from down here. 075:19:02 Collins: Yeah. Looks good up here too, Bruce. The crew of Apollo 11 are about to loop around the Moon's far side where they will fire the SPS engine to enter lunar orbit.